GEORGE ROTARY URGES YOU TO "SAVE OUR SEAS"
"Take 5 and Keep Our Seas Alive" will be launched again this coming December season on local beaches in an effort to curb plastic pollution during the holiday season. The 'Take 5' drive urges all beach users to pick up at least five pieces of beach litter and dispose of them correctly. The awareness campaign will run until 13th January 2019, but the clean-up drive will continue indefinitely. The anti-pollution project is a joint initiative between George Tourism, George Rotary Club and the George Herald. It mirrors similar successful campaigns in other countries such as the Australian "Two Hands Project" and "Take 3 for the Sea". Over 100-million marine animals are killed each year due to marine debris, according to the Sea Turtle Conservancy. Hundreds of thousands of plastic particles have washed up and continue to be deposited on our Garden Route beaches during high tides and storm swells. Indeed, research now suggests that over 9-million tonnes of plastic debris enters the world's oceans on a yearly basis (boomerangalliance.org.au). The vast majority of this plastic comes from land-based sources, such as domestic rubbish. Half of this are single use items such as plastic carrier bags, plastic lined coffee cups, cigarette butts, lighters, cold drink bottles, caps, drinking straws, disposable spoons, stirrers, lollipop and earbud sticks. Fishing waste is also present in the form of lines, lures, floats, reels and bait packaging. This plastic doesn't decompose; it is broken down into increasingly smaller pieces by the action of the sun and sea.In time, these tiny micro-plastics enter marine food chains, as they are unintentially consumed by birds, sea turtles, marine mammals and fish. The material causes digestive blockage, starvation and death. Fishing line, nets, bags and other plastic items can entangle sea creatures or be inhaled into their respiratory systems. Inspections of local beaches are also turning up thousands of tiny pieces of plastic, less than 5mm in diameter. These plastic pellets, about the size of lentils, are called nurdles. Countless billion are used each year as raw materials in the manufacturing of virtually all of the world's plastic products. They wash into the ocean from shipping accidents and are deposited along reefs and beaches. Once released into the sea, these nurdles absorb harmful chemicals such as pesticides, herbicides and organic pollutants. The pellets can then be consumed by wildlife, building up toxic chemicals in oceanic food chains. 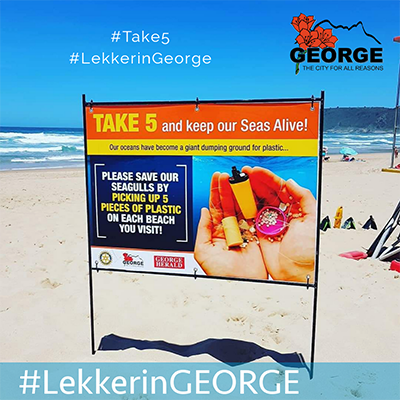 The Rotary Club of George is once again asking for support in this effort by giving "Take 5 and keep our seas alive" a resounding high five!The Take 5 campaign calls on local people, tourists and all beach users to be champions for the planet. The promotion is intended to develop mindfulness around plastic use and attitudes to waste disposal.